Arsenal legend Robert Pires has hailed Mesut Ozil, likening the German to Gunners ex-playmaker Dennis Bergkamp. Ozil led the club’s players providing assists last term. In addition, this term he has scored his first hat trick in an impressive goal scoring form. Arsenal coach Arsene Wenger has said that the German international could only be compared to the likes of Bergkamp when he signs a new deal with the club. However, Pires, who used to play alongside Bergkamp, opines that Ozil is already an equivalent of Bergkamp in the current set-up. “Something has clicked. What’s happened in the head is like a click because he’s scored a lot of goals. “This is a difference between the last season with Mesut Ozil and now because he’s thinking just for himself, and sometimes when you are in front of the target it is very important to score a goal,” Pires told Arsenal official website. “Mesut has very good qualities, he can normally score a minimum of 12 goals during the Premier League so in my time the maestro was Dennis Bergkamp, and now it is Mesut Ozil. I love them both because they play very good football but they play for the team. Not for himself, they play for the team. This point is very important for the future and of course for Arsenal,” Pires added. The Mirror reports that Ozil is close to agreeing a new deal with the club that would see him earn £200,000 per week. Representatives of the former Real Madrid star reportedly met with the club’s officials over the international break to refine contract details. The club values Ozil’s contributions and are willing to make him the highest paid player in the club with the new deal. The 28-year old player would see an increase of £60,000 from his current weekly wages at the Emirates. Robert Pires has recently come out to back Arsenal to take down Tottenham in their upcoming derby on Sunday. The Gunners Legend is of the opinion that Arsenal make for a stronger team than rivals Chelsea and Tottenham. Also, in what seems like an endorsement, Robert Pires has said that the Emirates stadium dwellers are ‘the best team in London’ and so therefore, there is definitely no reason why they can’t bring back the Premier League title this season to the Emirates Stadium. However, the 2016/17 squad will be unable to match that achievement as they have already lost one match. Yet, they are at present in second position on the table with 15 games unbeaten in all competitions so far. With the team’s high morale and momentum building, Arsenal seems to be in perfect shape for their derby game against North London rivals, the Spurs. Pires believes in the Arsenal set-up, and has endorsed them to come out victorious. However, he sees this as one sterner test of the Gunners’ title credentials. For a manager that has been struggling so much to win major pieces of silverware in this past decade, it’s fairly remarkable and unexpected to find out that Arsene Wenger has actually been approached by other clubs and this is the case of the French tactician. It has recently been revealed that the 66 year old manager has received offers to coach Paris Saint-Germain on multiple occasions but he has rejected all of those approaches as he has stated that his only true desire is to remain at the forefront of Arsenal. Arsene Wenger has been in charge of Arsenal since 1996 and in this time lapse of 20 years, he has developed a love-hate relationship with the supporters of the Premier League club. There are fans that aren’t so happy to see him at the Emirates Stadium as he has consistently failed to push Arsenal to the 1rst place position in any season of the Premier League from the past decade but there are supporters that have faith and trust in him. Arsene Wenger has once again confirmed that he will be prepared to spend big money on a player should there be a necessity. Arsenal have been linked with a number of forwards during the summer, but they have failed to make any major significance signings so far. There is growing concern amongst Arsenal fans with the season upon them. Arsenal were thought to be very close to securing Jamie Vardy for around £ 20 million from champions Leicester City. However, Vardy chose to stay at Leicester by signing a new four-year contract. Following this major blow, Arsenal shifted their attention towards Lyon forward Alexandre Lacazette. Negotiations have been going on for several weeks and it now looks highly unlikely that the club will be able to sign him since Lyon are unwilling to sell at Arsenal’s asking price. In contrast, Arsenal have given a take or leave offer to the French club. Even though performances in the pre-season friendly games have been extremely good, Arsenal fans feared that the upcoming 2016-17 season will be a repeat of the club’s performances in the last decade whereby they have not been consistent over the course of the season to create any major impact in the table. Serie A giant Juventus want Arsenal forward Alexis Sánchez to replace Álvaro Morata this summer, according to reports. Real Madrid activated their buy-back clause they had with Juventus to get Morata. The club is believed would resell the player for profits, after interests in the player increased following his impressive performance for Juve last season. Arsenal, Chelsea and a few other top clubs are in a battle to sign the Spanish forward this summer. It is likely that Madrid will sell to the highest bidder. On the other hand, Juventus are looking to replace the forward with Arsenal’s Sanchez. The Chilean was part of the team that defeated Argentina for the second time in a row to lift the Copa America played in the United States recently. Wales midfielder Aaron Ramsey claims that Arsenal manager Arsene Wenger has given him a lot of belief that the nation will be able to do something great that the Euro 2016. Wales are considered as one of the minnows amongst the home nations and they are taking part in the first major tournament in close to 60 years. Everyone from the coaching staff to the playing staff do not have experience of a major international tournament. This has been seen as a major disadvantage for Wales is specially being placed in a group like England, Russia, and Slovakia. 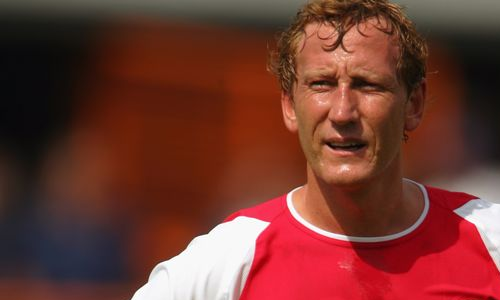 Ray Parlour believes that Arsenal will be able to compete in the Premier League title race only they make some big signings in the summer. A promising title challenge has once again become a race for the top four. This has been a replica of the gunners’ campaign or more than a decade. Only in the summer, it looked like Arsenal would be able to take advantage of Chelsea, Manchester City, and Manchester United suffering from poor form since the start of the campaign. Arsenal were in the race only with Leicester City back then. The 32 year old Serbian defender Branislav Ivanovic has recently spoke out about the current Premier League season which has seen Chelsea going from being the champions of England to dropping dangerously low in the league and are now settled in the middle section of the standings. Chelsea’s Premier League season has been a rollercoaster ride as they have gone from highs to lows and Branislav Ivanovic has also been a turbulent one. As each day goes by it seems like the spending power of the Chinese Super League increases as well and this is starting to become evident by the amount of high profile players that have been signed by the Asian clubs of that league. MesutOzil continues to gather the spotlight of the media as the German midfielder is one of the main driving forces behind Arsenal’s rise to the top of the Premier League. This was especially evident during Arsenal’s 2-1 victory over Manchester City. Ozil provided the assists for both of the goals that his teammates scored. The German player is going through such an impressive season that he is on course of breaking the current Premier League assist record which is being held by Thierry Henry. Henry is the current record holder for most assists in a single season after providing 20 assists back when he was performing for Arsenal but if MesutOzil continues his form then a new record will be set. There still are more than 20 games left in this season of the Premier League which is plenty of time for MesutOzil to mark his name in the history books of the English League.